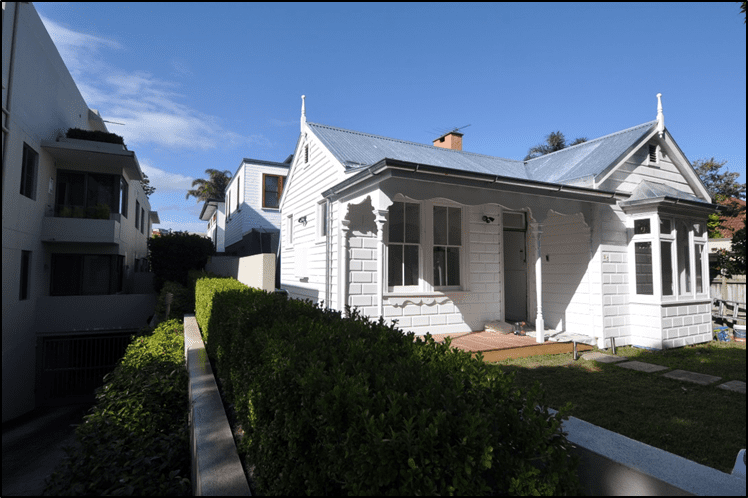 In 2013, when the owners purchased the heritage-listed timber cottage at 23 Spencer Street, Rose Bay, the building was in a state of disrepair. In 2014, a development application was approved by Woollahra Council which included the conservation of the heritage cottage and construction of a new two-storey rear addition. In 2015, building works started and Heritage 21 was appointed as the Heritage Architect to oversee the heritage conservation works. Due to extensive damage to the timber cottage, including the structural timbers, collaboration with the structural engineers was required. These works involved all unsound structural timbers being replaced, while the cottage walls were reinforced internally with 15mm plywood sheeting. The original chimney was another significant structural issue as it had subsided. This was a high priority during the conservation works and required the use of epoxy underpinning. Due to the chimney subsidence, the western wall near the chimney had shifted by 40mm, causing it not to be perfectly plumb. This was stabilized and internally cladded to make up the difference. The conservation works also included restoration of the original windows by heritage joinery company Blueridge Woodworks. The front bay window had endured numerous alterations, which were addressed by the joiner. The window seat was also retained. Non-original elements such as latticework and balustrade panelling were removed and the original elements of the cottage were reinstated. The non-original imitation tiling roof was removed and replaced by galvanised corrugated iron sheeting, which will weather to a dull grey. This has reinstated the cottage roof to its original appearance. The new rear addition has been designed with great care to ensure the original and non-original structures are connected with sensitivity. Due to materiality and intricate details, the old and new sections of the house flow seamlessly when manoeuvring through the building. In this space, which was originally the dining room, the fireplace has been retained and conserved, with a new sandstone hearth installed. New timber floorboards connect the heritage cottage to the new extension, with natural light provided by new skylights and timber sliding doors. Heritage 21 is very honoured to have been a part of restoring this cottage to its original glory and is delighted this revived heritage building will once again provide a comfortable home for its owners.